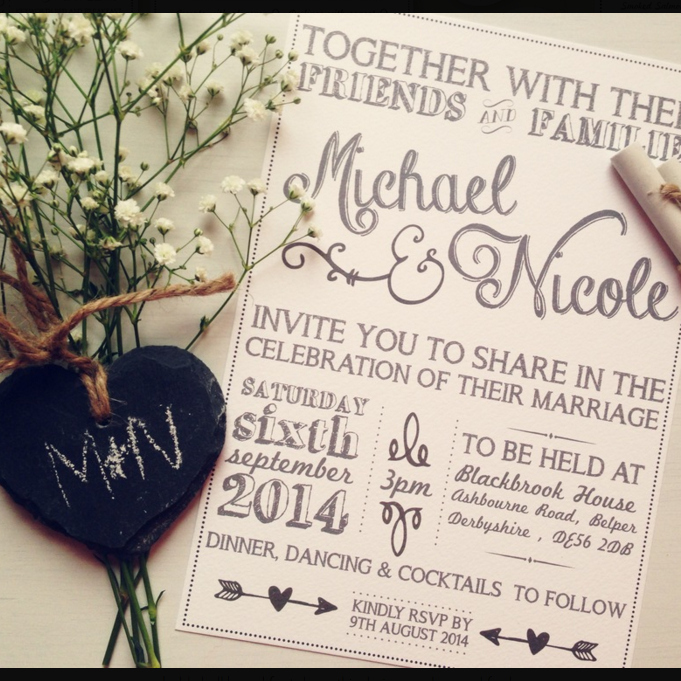 For a laid back vintage feel this wedding invitation ticks all of the boxes! It makes us dream of little French villages, with patisseries and boulangeries and little chalk boards leant on the stone walls outside, advertising the delicious treats that are fresh out of the oven. Full of character and a rustic charm, what makes this design stand out is the mix of different fonts and quirky layout. It really is an invitation that celebrates your up and coming big day, just like a poster for a vintage festival with the starring roles, the Bride and Groom, names written in a beautiful handwritten-style typeface. The attention to detail is impressive, from the dotted border and fancy ampersand to the hatching on the 3D lettering of the wedding date and two of cupid’s arrows at the very bottom of the invite. This invitation from Best Day Ever will get lots of ‘Ooohs’ from your guests when they receive it in the post! The quality doesn’t end with the visuals though; this collection is printed on 250gsm fine Italian Tintoretto Gesso, providing a gorgeous textured hammered feel for that luxurious finish. A soft grey and cream colour palette provides a versatile starting point for those of you who are yet to decide on a theme; cute pinks, creamy yellows, olive greens, deep reds, you name it, we’re sure any colour would work with the Vintage Chalk design!